Way back in the dark ages - well not really- back when I was a young teenager anyway, I read a quote that's for some reason just resonated with my sole. At the time it was quoted by the the late President John F Kennedy. Kennedys take on Gearge Bernard Shaws quote was worded slightly different. "Some men see things and ask why. 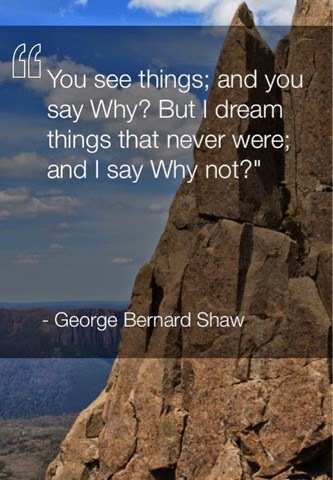 I dream things and ask why not." I quickly sat down and wrote it in my best fancy writing and put it up on my wall. It stayed with me for many years moving to different locations in my room. When I got married at 20 my little quote was moved into a scrapbook for safe keeping. Unfortunately over the years my little quote got lost and I hadn't seen it written until today when my "Quote for the Day" flashed up on my phone. Why at such a young age did these words grab me so much and why today when I read it again did I feel compelled to write a blog post about it? I still don't have the answer is it because I have a curious mind, is it that I question everything? I don't know but I think tonight I am going to once again write this little quote in my fanciest writing and put it up so I can once again ponder it's words.